It is stated in the New Testament that Jesus visited the region of Tyre and Sidon and healed a Gentile (Matthew 15:21; Mark 7:24) and from this region many came forth to hear him preaching (Mark 3:8; Gospel of Luke 6:17, Matthew 11:21–23). A congregation was founded here soon after the death of St. Stephen. Paul the Apostle, on his return from his third missionary journey, spent a week in conversation with the disciples there. According to Irenaeus of Lyon in On the Detection and Overthrow of the So-Called Gnosis, the female companion of Simon Magus came from here. The Tyre Coast Nature Reserve covers over 380 hectares (940 acres) and divided into three zones: the Tourism zone (public beaches, the old city and Souks, the ancient port), the Agricultural and Archaeological zone, and the Conservation zone that includes the Phoenician springs of Ras El Ain. Due to its diverse flora and fauna, the reserve is a designated Ramsar Site. It is an important nesting site for migratory birds and the endangered Loggerhead and green sea turtle and the shelter of the Arabian spiny mouse and many other important creatures (including wall lizards, common pipistrelle, and european badger). Threats to Tyre's ancient cultural heritage include development pressures and the illegal antiquities trade. A highway, planned for 2011, was expected to be built in areas that are deemed archaeologically sensitive. A small-scale geophysical survey indicated the presence of archaeological remains at proposed construction sites. The sites have not been investigated. Despite the relocation of a proposed traffic interchange, the lack of precise site boundaries confuses the issue of site preservation. The hostilities of the 2006 Lebanon War put the ancient structures of Tyre at risk. This prompted UNESCO's Director-General to launch a "Heritage Alert" for the site. 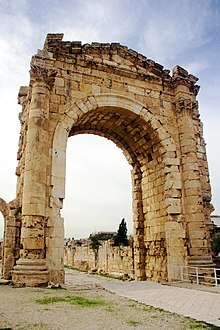 Following the cessation of hostilities in September 2006, a visit by conservation experts to Lebanon observed no direct damage to the ancient city of Tyre. However, bombardment had damaged frescoes in a Roman funerary cave at the Tyre Necropolis. Additional site degradation was also noted, including "the lack of maintenance, the decay of exposed structures due to lack of rainwater regulation and the decay of porous and soft stones". Like many of the cities in the Levant and in Lebanon, the architecture since the Lebanese Civil War in the 1970s has been of poor quality, which tend to threaten the cultural heritage in the built environment before the war. According to Joshua 19:29, Tyre is referred to as a "strong city," and was allotted to the Tribe of Asher. King Hiram I was a contemporary of David and Solomon in 2 Samuel 5:11, 1 Kings 5:1, and 1 Chronicles 14:1. Tyre is mentioned in the Book of Isaiah (Isaiah 23), the Book of Jeremiah (Jer 25:22, Jer 47:4), the Book of Ezekiel (Ezekiel 26-28), the Book of Joel (Joel 3:4-8), the Book of Amos (Amos 1:9-10), the Psalms, and the Book of Zechariah (Zechariah 9:3-4), which prophesied its destruction. Jesus visited the region or "coasts" (King James Version) of Tyre and Sidon (Matthew 15:21; Mark 7:24) and from this region many came forth to hear him preaching (Mark 3:8; Luke 6:17), leading to the stark contrast in Matthew 11:21–23 to his reception in Korazin and Bethsaida. In the Book of Revelation, Revelation 18 alludes extensively to the mercantile description of Tyre in Ezekiel 26-28. In 19th-century Britain, Tyre was several times taken as an exemplar of the mortality of great power and status, for example by John Ruskin in the opening lines of The Stones of Venice and by Rudyard Kipling's Recessional. Tyrus is the title and subject of a poem by the Cumbrian poet Norman Nicholson in his collection 'Rock Face' of 1948. Collège Élite, a French international school, is in Tyre. Jaafareya High School was the first intermediate and secondary school in south of Lebanon. The population of Tyre is a predominantly Shia Muslim with a small but noticeable Christian community. However, the city of Tyre is home for more than 60,000 Palestinian refugees who are mainly Sunni Muslim. The Amal Movement and Hezbollah are the most popular parties, representing all of the Shi'a seats in the city as of the 2009 elections. In 2010, it was estimated that Christians accounted for 15% of Tyre's population. ^ Robin Lane Fox, Alexander the Great 1973:181f. ^ See Jidejian, Nina. Tyre Through the Ages, 1969, for further information about the history of Tyre and its present condition. ^ 'Tyre' from Encyclopædia Britannica 11th ed. ^ Bement, R B. Tyre; the history of Phoenicia, Palestine and Syria, and the final captivity of Israel and Judah by the Assyrians. Ulan Press. p. 47. ASIN B009WP2MR8. ^ Herodotus (2008-04-17). The Histories. Oxford World's Classics. p. 137. ISBN 9780199535668. ^ Bement, R B. Tyre; the history of Phoenicia, Palestine and Syria, and the final captivity of Israel and Judah by the Assyrians. Ulan Press. p. 48. ASIN B009WP2MR8. ^ a b Katzenstein, H. Jacob (1979). "Tyre in the early Persian period (539-486 B.C)". The Biblical Archaeologist. 42 (1): 23–34. JSTOR 3209545. ^ "Strolling in old Tyr – LebanonUntravelled.com". Retrieved 2019-02-13. ^ The toll of three cities, The Economist June 19, 1982. p. 26. ^ "Protecting marine biodiversity in Lebanon". International Union for Conservation of Nature (IUCN). 2 May 2012. Archived from the original on 11 August 2014. Retrieved 17 August 2014. ^ Hany El Shaer; Ms. Lara Samaha; Ghassan Jaradi (Dec 2012). "Lebanon's Marine Protected Area Strategy" (PDF). Lebanese Ministry of Environment. ^ Helga Seeden (December 2, 2000). "Lebanon's Archaeological Heritage". ^ a b Toubekis, Georgios (2010). "Lebanon: Tyre (Sour)". In Christoph Machat, Michael Petzet and John Ziesemer (Eds. ), "Heritage at Risk: ICOMOS World Report 2008-2010 on Monuments and Sites in Danger" (PDF). . Berlin: hendrik Bäßler verlag, 2010, pg. 118. ^ Koïchiro Matsuura; The Director-General of UNESCO (August 11, 2006). "UNESCO Director-General Launches "Heritage Alert" for the Middle East". UNESCO World Heritage Centre. ^ "Bishop of Tyre: Christians in Lebanon have become a minority in their country". ^ "Saint Christina of Tyre (July 24)". Official website of the Antiochian Orthodox Christian Archdiocese of Australia, New Zealand and the Philippines. Retrieved September 27, 2015. 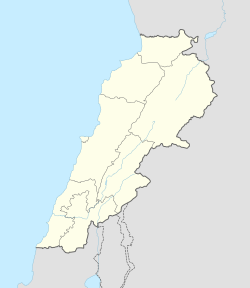 Wikimedia Commons has media related to Tyre, Lebanon. Wikivoyage has a travel guide for Tyre, Lebanon.